Imagine your favorite bike with the rear wheel stretched out behind the seat, a big, stable platform for a load or a passenger, and the most simple, load-swallowing saddlebags (we call them FreeLoaders-click to see what makes them so different) you’ve ever used. You have the freedom to carry anything, without planning ahead or using any special gear, and best of all, you don’t sacrifice the feel or performance you’ve come to count on. Your bike is still lightweight and fast, and because the load is centered between your two wheels, the whole package handles with so much ease you might literally forget it’s even there. Now imagine that you get all this utility by attaching an accessory that will make you wonder how you ever got along without it. And why someone didn’t think of it sooner. Testing Grounds : Mean Streets of LA, San Gabriel River Trail, Irvine Park and my neighborhood. When RL told me we were getting a Xtracycle to review, I quickly volunteered my favorite commuter bike as ‘the test bike’. Being an exceptional wrench, RL assembled and installed the Freeradical on my Kona Smoke. I volunteered to ride the Kona with the Freeradical to work, to do errands, park, beach and around the neighborhood hauling my kids. Versatility, versatility and more versatility. The panniers that came with the Freeradical (called Freeloaders) are HUGE. 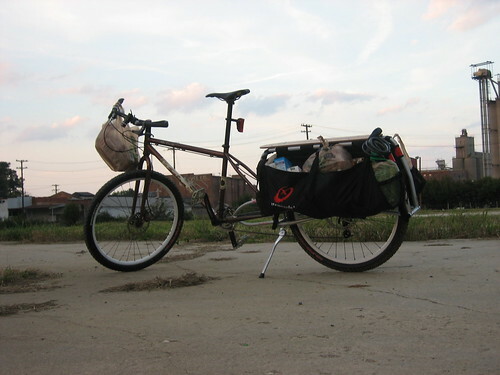 When I rode to work, I carried my bike messenger bag with my change of clothes, my lunch and my laptop briefcase. When I rode to the beach I was able to carry towels, dry clothes, sand toys and my kite. With a 150lb of carrying capability, I didn’t have to worry about doing ‘honeydo’s’ after work. One time I was able to carry the front and the rear tins for my bug, A Tippmann A5 paintball marker with a Proto Switch EL mask and an 83 ci Compressed air tank. All this stuff plus my messenger bag AND my laptop briefcase. As far as weight goes, the Kona did gain some weight, but nothing unmanageable. Bike handling was not affected, I used to forget that I had an extra 15 inches on the back of the bike. I also liked the looks, the platform/cutting board tied in with the SoCal looks. There was one issue that I had with the Freeradical, when you apply the rear brake and if you are not carrying anything in the back,the rear wheel will skid easily. I learned to compensate the lack of rear stopping power with the front brake. Xtracycle’s website will let you know that the Freeradical is not for everyone. BUT, if your bike is your sole mean of transportation, the Freeradical is worth it’s value in gold (or in these days, gasoline). Once you have it, you’ll be wondering why you didn’t buy it before. As a bike commuter, the Freeradical adds the convenience of not worrying about going to the store before or after work. As a recreational cyclist, the Freeradical adds the versatility of carrying the necessary stuff to have fun so you can leave the car at home. I need to get a folding bike first… then Free Radical. Hey Sue, what do you like most about your Freeradical? I’ve been using one for the last 4 years on an old rigid Rockhopper. -Enough camping gear for 1 week, unsupported. -Two bicycles. Towed by dropping the front wheels in the “Freeloaders”. I do this almost daily in my job doing maintenance for a bike share program. -An 8 by 10 foot sheet of colorplast (plastic cardboard). Tricky that one. -An Electric guitar, two mic stands, one Roland Jazz Chorus Amp, a tool box of cables and a courier bag of clothes. -One fiance and groceries for a week. Each point is what I carried in one go, some with the optional horizontal racks and the “Longloader” stand-off bar. It makes the bike track really straight on snowy roads. -You’re forever answering the question: “Did you build that thing?” Mind you, I’m the only one in this city that has one. -Sluggish cornering. You do get used to the handling but if you switch bikes often it’s quite noticable. -The front end dives a bit on corners. It feels like the frame is pushing harder against the front wheel on tight corners especially when loaded. I’ve slid out the front wheel a couple of times where I felt that an ordinary bike wouldn’t have. This has always been at very slow speeds while trying to do pretty technical stuff. Makes sense. By moving the rear wheel back you’re placing more weight on the front one. All in all the Xtracycle does everything the company claims it does. Probably the only cycling product I’ve used that I’d say that about. Can you post a pic of what the smoke looked like with the free radical? Can someone explain the Mystery horn on the Kona Smoke? Thanks! I’ve been searching for a new purpose for my old Specialized Hardtail. This is EXACTLY what I’m going to do with it. Thanks for reviewing and sharing!